#10 Dodgy deal in the pipeline? The demise of the fossil fuel industry is a major headache for Australia’s big banks. Having provided the debt that fueled the last big fossil fuel boom, the likes of ANZ, CommBank, NAB and Westpac now find themselves exposed to projects that are both environmentally and financially toxic, as markets for fossil fuels decline and the world implements the Paris climate change agreement. 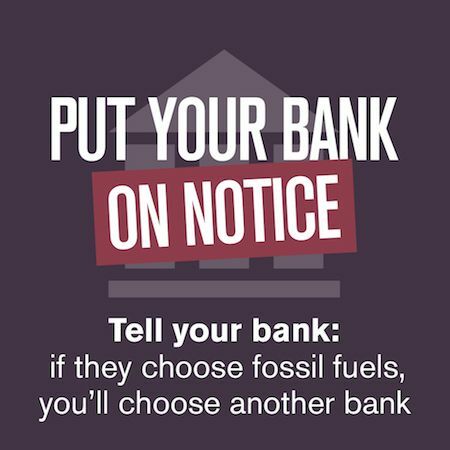 Each of Australia’s big four banks are being dragged down by loans to fossil fuel companies and projects. In May 2016, Westpac revealed lower than expected cash profits of $3.9 billion, having added $252 million to its bad debt charge for the quarter. According to CEO Brian Hartzer, these “higher impairment charges related principally to four large exposures,”; commentators pointed to Peabody Energy and Wiggins Island Coal Export Terminal (WICET) as likely offenders. Bad debt charges cost NAB $341m for the quarter, although this was slightly less than the same time in 2015, when they were forced to add an overlay for bad mining and agriculture debts. CommBank’s bad debts also increased to $6.3 billion in May 2016, the highest reported since December 2014. Loan impairments cost the bank $427m during the third quarter of the 2015-16 financial year, including “a single relatively large domestic exposure with a syndicate of lenders including other Australian major banks.” Wondering what that deal could be? See if you can spot it in these ten dodgy deals! 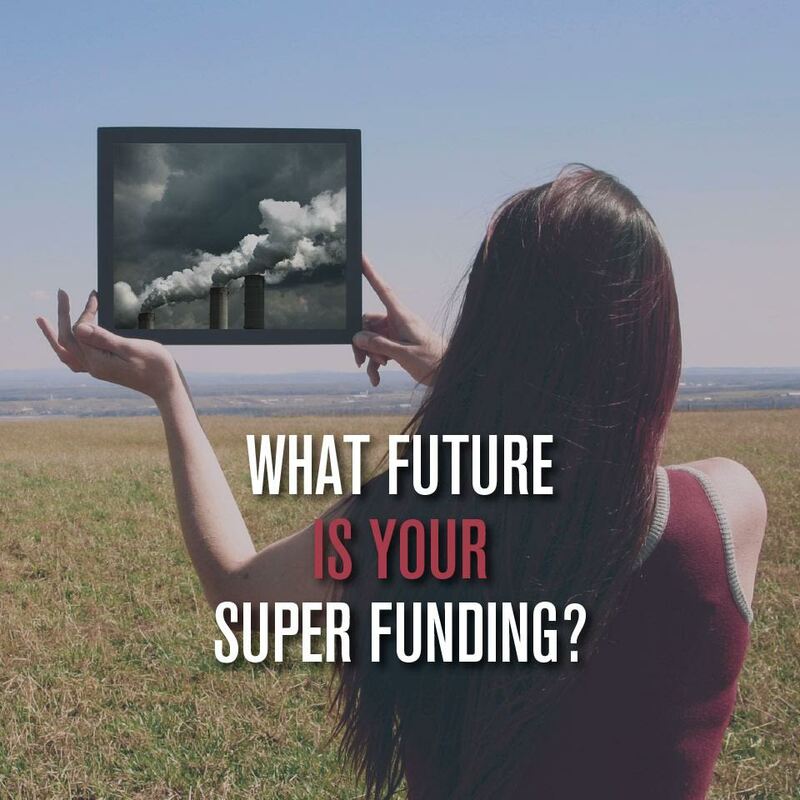 The resources boom has turned to spectacular bust for fossil fuel industries, with the thermal coal industry in structural decline and gas oversupply tipped to keep prices down for the foreseeable future, undermining the hundreds of billions of dollars invested in massive LNG plants. At the same time, the collective public ambition to transition to a low carbon economy has never been stronger, as we begin to see some of the terrifying effects of climate change that will only worsen as the world continues warming to unprecedented levels. Politicians are slowly catching up with the rest of the world, highlighted by the Paris agreement to keep global warming well below 2°C. The carbon budget imposed by this limit means around 80% of global fossil fuel reserves must remain in the ground. Below are ten of the worst coal and gas deals hanging over the Australia’s banks, threatening to leave them billions of dollars out of pocket. Described as “arguably the last great boom-time bugger-up” the Wiggins Island Coal Export Terminal (WICET) at Gladstone in Queensland has over the past decade bankrupted four Australian coal miners and cost banks and investors billions in losses. 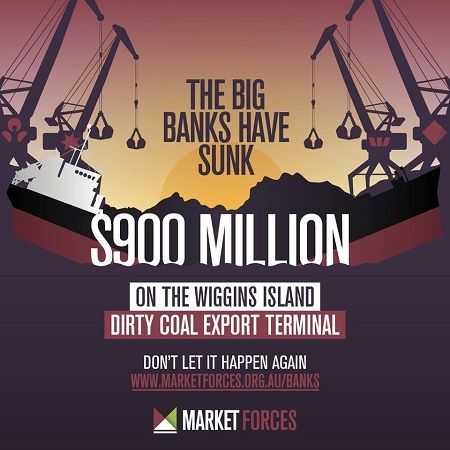 Australia’s big four banks are all tied to the misfortunes of this dodgy coal port. ANZ is the most heavily exposed, having provided $417m worth of project finance back in 2011. That deal also saw CommBank, Westpac and NAB chip in $164m each. Originally planned by coal giant Glencore and seven partners, including New Hope Corporation and Yancoal, WICET was approved in 2008 as an 84-million-tonne-a-year export facility. Only one of the three planned stages of the project has eventuated – at twice the initial cost – with a 27 million tonne capacity. Since then, several partners – Caledon Coal, Bandanna Energy and Cockatoo Coal – have all gone belly up. Caledon was liquidated in July 2017, leaving the five remaining owners to repay the debt. In April 2018, Nomura bought $81 million of Caledon’s preferred shares in WICET for less than 60 cents in the dollar, showing just how little the market thinks of the asset. Export charges at WICET are up to $25 a tonne – five times more expensive than a nearby port – and its partners must pay for any unused capacity. So while the port is operating well below capacity, these tough contract terms are keeping it afloat for now. But with mounting pressures on the remaining counterparties, the project looks shaky at best. Negotiations for several refinancing proposals fell over, with banks unwilling to accept worse terms than the original deal. In March 2018, the 20 original lenders – owed a combined $3.5 billion on WICET – agreed to provide a ‘financial lifeline’. Finally in September, WICET obtained court approval for a $3.2 debt refinancing plan, with the maturity of $2.6 billion in senior debt extended until 2026. While obviously offering welcome respite, this doesn’t deal with WICET’s core problem: the port’s high costs and low export volumes. On top of this Glencore, which owns 40% of WICET, recently announced it now plans to cap its own coal production globally in response to climate change, sending shockwaves across both the financial and coal sector. WICET is also beset by internal legal wrangling. It faces possible legal action from some junior lenders who provided A$550m of the Wiggins Island Preferential Shares (WIPS) in the original project deal and claim they are owed A$40m in unpaid dividends. Four WICET partners also started legal proceedings in late 2018 against co-owner New Hope over its failure to deliver a 500,000 tonne coal export contract from its undeveloped Colton Coal mine, which New Hope has put into voluntary administration. 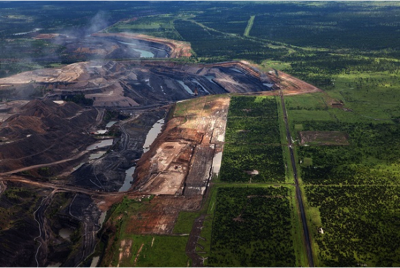 Coal mining in Queensland’s Bowen Basin, where Peabody operates five mines. In April 2015, the world’s biggest privately-owned coal producer Peabody Energy filed for Chapter 11 bankruptcy protection under US law, unable to service its $8billion debt. Key reasons cited for filing included “industry pressures in recent years including a dramatic drop in the price of metallurgical coal, weakness in the Chinese economy, overproduction of domestic shale gas and ongoing regulatory challenges.” Throughout 2015, Peabody lost over $2.5b and its share price plummeted 97%. The future of its Australian arm looked precarious, with 10 of Peabody’s 28 mines located here, although its opaque corporate structure made it hard to work out exactly how much. By 2017, however, the coal miner had come out of Chapter 11 bankruptcy, having reduced debt by $5billion. Australia’s big banks CommBank, NAB and Westpac have all been exposed to Peabody’s rollercoaster fortunes. Each contributed $49m to facilitate Peabody’s purchase of Macarthur Coal in October 2011 – debt that was downgraded by both major ratings agencies – Moody’s and Standard & Poor’s – to “very high” and “substantial” risk ratings respectively. Reports in August 2016 also highlighted that CommBank expected to lose $72 million from its Peabody exposure. For an industry driven by massive profit motives, even skimming this loss from the bank’s margin will have hurt. 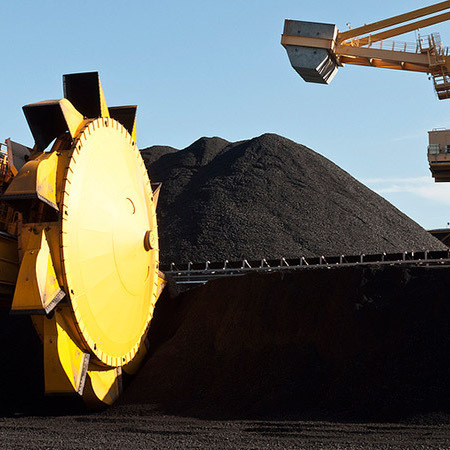 Despite Peabody’s losses, NAB was happy to back the coal miner in its plans to expand the Wambo Coal mine in NSW’s Hunter Valley, facilitating a $250million inter-company loan between Peabody and its Australian subsidiary in 2016. Peabody claimed this put it in a strong enough fiscal position to proceed with Wambo’s expansion. Such support is wholly at odds with NAB’s commitment to help hold global warming to below 2C degrees. See how the big banks are doing on their commitments on global warming. Back in 2016 Adani’s Abbot Point terminal was hit with a credit rating downgrade that left it just one notch above ‘junk’ status. 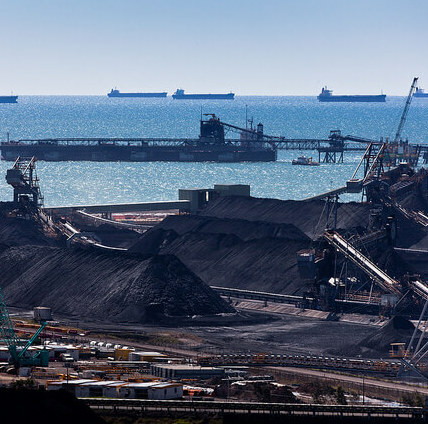 Despite destructive plans to expand the port to accommodate coal from the Galilee Basin, the economic outlook for Abbot Point port is gloomy, with the amount of coal contracted to be shipped via take-or-pay contracts predicted to fall rapidly from 2020. Analysis from IEEFA suggests the coal terminal “runs the risk of becoming a stranded asset” if Adani’s Carmichael project doesn’t go ahead. The port needed to refinance $1.5 billion of debt in 2018, and over $2 billion by 2020. Without the promise of extra capacity being filled by Carmichael coal, and given the big four Australian banks’ aversion to the project, securing this refinancing has proven difficult. Reports from 2014 and 2016 show Adani has been unsuccessfully trying to sell a stake in the port for years. In 2018 they appointed investment bank Rothschild to advise on the sale. While Adani hasn’t yet found anyone foolish enough to buy a stake in Abbot Point, it was successful in refinancing part of the debt linked to its purchase. After a desperate year-long search, Korean asset manager Mirae Asset Daewoo bought $330 million worth of Adani’s $2billion debt, with the aim of on-selling it to Korean insurance companies and other investors. Find out which companies could make or break Adani’s Carmichael plans. As a pure-play coal company, Whitehaven’s fortunes have no insulation against the long-term structural decline of the industry, which saw the company’s market value drop more than 90% from its April 2011 peak to 2016. Rescued by strong Asian demand and a surge in world thermal coal prices in 2018, Whitehaven continues to doggedly operate as if the Paris climate agreement signed by 197 countries doesn’t exist. At its 2017 AGM it projected a 10% increase in coal power globally by 2040, a scenario consistent with up to 6C global warming! Whitehaven owns and operates one underground and four open-cut coal mines, including Maules Creek. 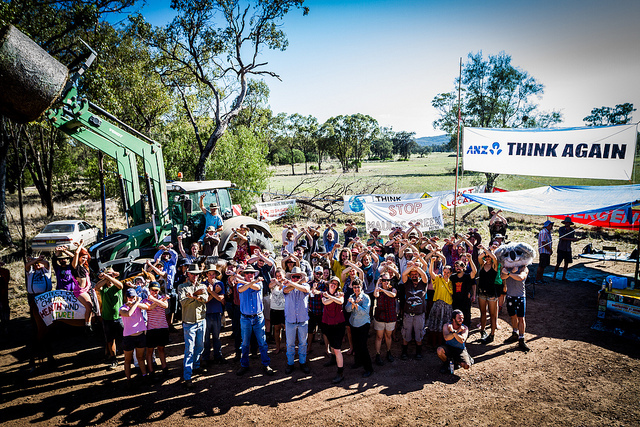 Having destroyed part of NSW’s Leard Forest, the Maules Creek project has faced strong and sustained community opposition. All four coal mines breached their licence conditions most years between 2010 and 2016 by exceeding coal dust pollution levels and polluting waterways. In 2017 the EPA upgraded Maules Creek to its highest risk category. Despite Whitehaven’s appalling environmental record, shaky finances and lack of social license to operate, the miner attracted a $1.4b refinancing loan in March 2015, with ANZ, NAB and WBC each contributing $100 million. Just a few months later, nervous lenders were reportedly already looking to exit the deal, with the huge risks associated with coal exposure finally beginning to sink in for at least one bank. These jitters were sadly short-lived though, with ANZ, NAB and Westpac deciding to arrange a $1 billion, two-year extension to a corporate financing deal for Whitehaven in August 2017. As the world’s biggest coal export port, Newcastle’s fortunes are dangerously linked to the fortunes of the coal sector. The Newcastle Coal Export Terminal (NCET) is one of three terminals at Newcastle, and is owned and operated by the Newcastle Coal Infrastructure Group (NCIG), which is in turn owned by a group of coal producers including BHP, Yancoal, Whitehaven and Peabody. NCIG was placed on review for downgrade in December 2015, with Moody’s analyst Mary Anne Low stating that “the sustained weakness in coal prices and the uncertain duration of the downturn is increasing the likelihood of counterparty failure and consequent volatility in NCIG’s cash flows”. That rating downgrade took place in June 2016, with the group’s debt downgraded to “junk”. The downgrade followed a failed attempt by NCIG to refinance $500 million of its debt. BHP Billiton also failed to refinance $500 million of its debt, with banks apparently less willing to lend to the sector because of its poor outlook. In 2016 the terminal project (NCET) was reportedly seeking a refinancing deal for its $3.5b worth of loans. In August 2018 it was announced that the port’s debt had been refinanced by a syndicate of ten lenders which included ANZ and Commbank. A newcomer to the syndicate included NAB. Over the years, NCIG has attracted over $2 billion of finance from Australia’s big four banks. Back in January 2008, ANZ provided $388 million to enable the initial construction of the NCIG terminal, along with a further $138 million loan for the post-construction phase. Through 2010 and 2011 the terminal was expanded over two stages, attracting a total of $569m from ANZ, $461m from CommBank and $241m from NAB. Some of the debt for the terminal’s expansion was refinanced in March 2014, with ANZ chipping in $294m and NAB providing $102m. 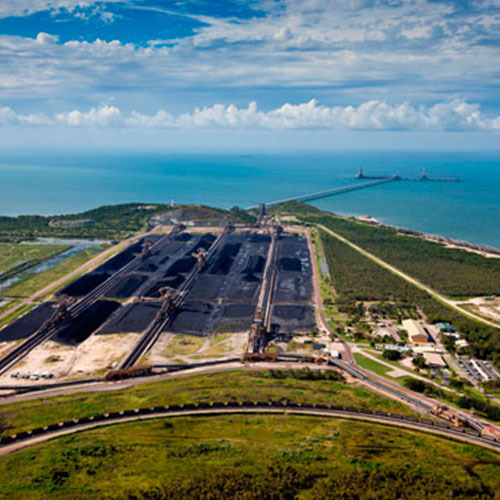 Dalrymple Bay near Mackay in the Great Barrier Reef Heritage Area Queensland is yet another example of an Australian coal port under pressure. Moody’s in March 2016 downgraded Dalrymple’s credit rating to non-investment grade. That was before Peabody’s bankruptcy announcement, which would have sent further shivers through Dalrymple – Peabody produced a quarter of all coal shipped from the port! With Peabody’s future Australian operations uncertain, and fellow Dalrymple user Anglo American selling its Australian coal mines at the time, you’d think the coal port’s creditors would’ve been worried, right? Apparently not. Having each loaned $50m to Dalrymple Bay in September 2014, ANZ and Westpac had a chance to cut ties in July 2016. But instead, the two banks ignored the ratings downgrade and Peabody’s massive debt, and became lead arrangers for a $350m refinancing deal, with reports they would underwrite the debt themselves. 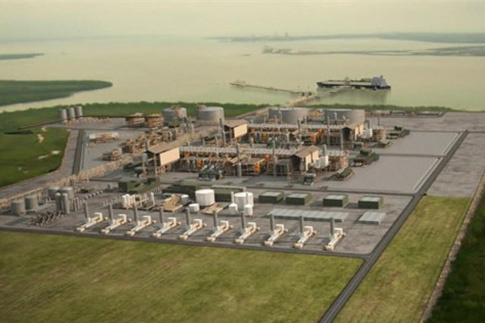 Origin’s Australia Pacific LNG project (APLNG) is one of three massive, high-cost LNG facilities built on Queensland’s Curtis Island. With a whopping price tag of $24.7 billion, APLNG was a bullish bet on huge future LNG demand from the likes of Japan, Korea and China. This didn’t eventuate, with China’s demand remaining steady and Japan and Korea’s actually declining in 2015-16. With an extra 100 million tonnes of LNG due to flow from new projects into the global market, prices in 2016 slumped to less than 25% of those in early 2014. The spot price of around US$4.50 per unit was so low that APLNG exports couldn’t cover its operational and financing costs. In more bad news for the LNG sector, Japan investigated the legality of purchase contracts that block the on-sale of LNG to other countries. Worth an estimated $800 billion, these contracts may have to be renegotiated at a time when prices are extremely low, giving purchasers much more bargaining power than producers. With massive oversupply predicted, new contracts could even see Japan soon become a net exporter of LNG. After downgrades in 2015, both major ratings houses – Moody’s and Standard & Poor’s – listed Origin at just above junk status in 2016. Reports suggested Origin was looking to separate its oil and gas production arm from its domestic power business in a bid to prevent further downgrades. In August 2017, the company wrote down $1.2 billion from APLNG’s value. Australia’s big banks are all heavily exposed to Origin. All four are thought to be involved in the $3 billion refinancing of APLNG, which is expected to reach financial close by the end of March 2019. Previously ANZ and NAB each contributed $250m to a corporate financing deal in September 2011, while all big four banks participated in the APLNG project original $8.6 billion financing in May 2012. That deal saw ANZ stump up $359m, Westpac $307m, and NAB and CommBank $256m each. As if these numbers weren’t big enough, NAB, ANZ and CommBank each contributed a further $200m in a December 2014 refinancing. Santos’ GLNG project, also residing on Curtis Island in the Great Barrier Reef World Heritage Area, is worth a great deal less today than the $10 billion it was valued at in 2015, when Santos embarked on the first of three write downs. The first $565m impairment charge contributed to Santos’ massive total $2.7b loss in 2015. The project’s fortunes slid further in 2016, with a bigger write down of $1.5 billion announced in August, and another $1.1 billion in August 2017. Environmental concerns over coal seam gas (CSG) drilling in Queensland and NSW has put future supplies at risk and led to a moratorium in some states. GLNG is supplied by Santos’ highly controversial CSG projects in the Bowen and Surat Basins. 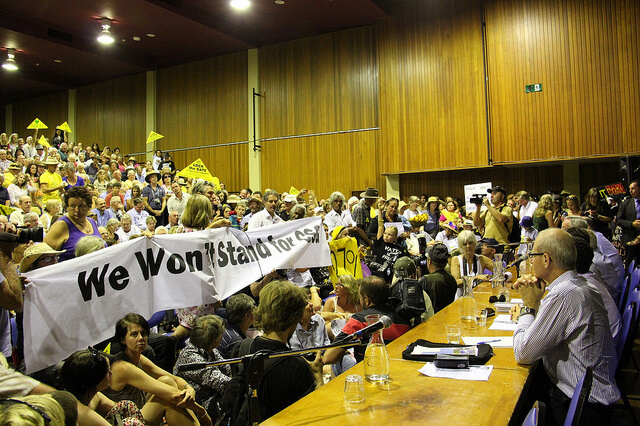 Santos’ proposed Narrabri CSG project has also hit various stumbling blocks including furious community opposition, with its plans to drill 850 CSG wells in the Piliga forest sparking over 22,000 objections. The Narrabri project had originally been written down by $800m to $500m in 2015, before Santos announced in February 2016 it had written down the total value of its NSW assets to $0. When GLNG was originally financed in 2011, ANZ contributed $305m and NAB and CommBank each chipped in $132m. In December 2014, ANZ also provided a $1billion bilateral bank facility to Santos to help restructure the crippling debt obligations imposed by GLNG, Narrabri and other struggling projects. As the owner and operator of coal and iron ore rail systems, Aurizon is inextricably linked to the fortunes of those industries. In fact, the company has been described “as close as you can be to a coal miner without digging the stuff up.” Almost 70% of the company’s revenue in 2015 was derived from coal-related business. 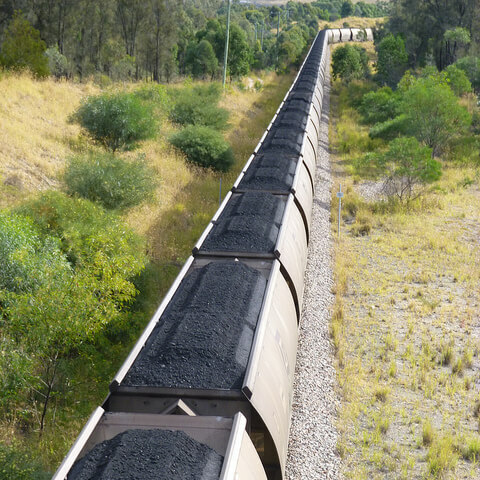 Recognising this level of dependence on ailing coal producers is far from a healthy business model, a Moody’s review of Aurizon in 2016 confirmed their ‘moderate credit risk’ rating and noted a negative outlook. With many of Aurizon’s coal-producing clients – including Peabody and Whitehaven – struggling to hold on through the industry’s terminal decline, the flow-on effect to Aurizon’s bottom line saw the company’s net profit announced June 2016 drop to $72m, a massive 88% less on the year before. Australia’s big four banks all participated in an Aurizon refinancing deal in 2013, which was due to be repaid in 2018. NAB and CommBank each contributed $236m, while ANZ and Westpac loaned $143m apiece. 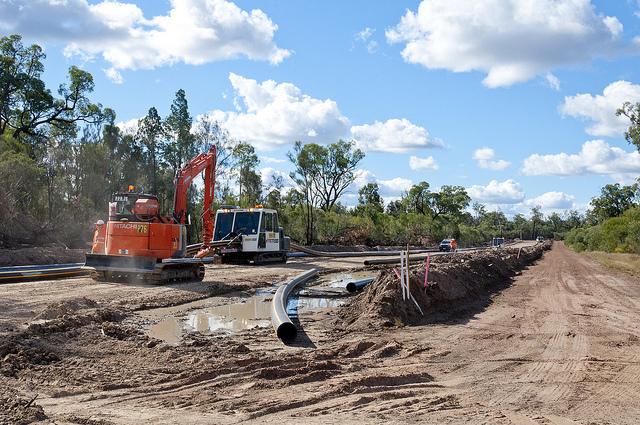 The North East Gas Interconnector proposes to link Tennant Creek in NT to Mt Isa in Queensland, effectively hooking NT gas reserves into the eastern gas market. The contract to construct and operate the pipeline was controversially awarded to Chinese- and Singaporean-owned Jemena, giving the company an unregulated monopoly over the project. Construction of the $800m pipeline began in July 2017. In 2016 the ATO was asked to investigate Jemena over a potential tax avoidance system that could cost Australia $500 billion over 35 years. Doubts over just how much gas will actually be supplied from NT reserves forced the company to reduce the size of the proposed pipe. Growing wariness over unconventional gas extraction and lower than expected demand have led many to question the necessity of the pipeline, but politicians continue to push it as a ‘nation-building’ project. The $800m project is backed by Chinese and Singaporean state-owned power companies, and has not sought any debt finance from Australia’s banks. But this is yet another example of a dodgy fossil fuel project could lock in oversupply and slow down the transition to clean energy sources – all without providing any financial benefit to Australia. Callide C, the fourth largest coal-fired power station in Queensland, went into receivership in July 2016 after failing to meet a $50m debt repayment deadline. The debt stemmed from a package worth around $350m provided in June 2012. Having loaned $125m, NAB was by far the biggest player in the deal, which also involved four international banks. Since then it appears US private equity firm KKR have taken over Bank of Scotland’s share of the debt, while some redistribution amongst the lenders may have occurred. While this financial distress won’t stop the power station from running in the short term, the lenders will now need to work out how to handle the insolvency of the plant’s owners. 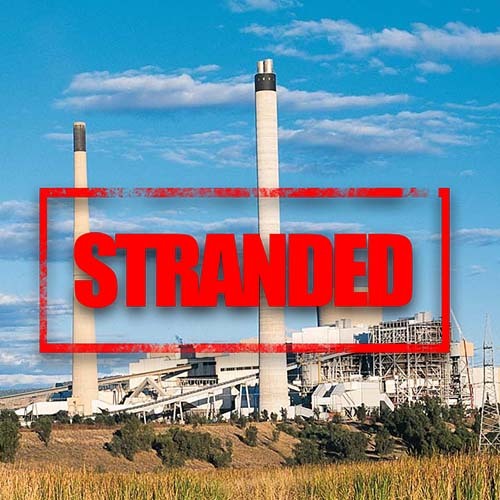 NAB and co could find themselves the proud owners of a loss-making coal-fired power plant. Whatever the outcome, it’s a messy future for the banks who backed this dirty coal power plant, which should serve as a lesson for any bank considering their involvement in the sector.